As of March of 2012, a law was passed in accordance with the Americans Disabilities Act requiring all public swimming pools in the U.S. to be equipped with assisted entry systems for use by disabled individuals. Maintenance of ADA chairs requires constant maintenance and removal of rust on metal parts for safety, endurance and appearance. 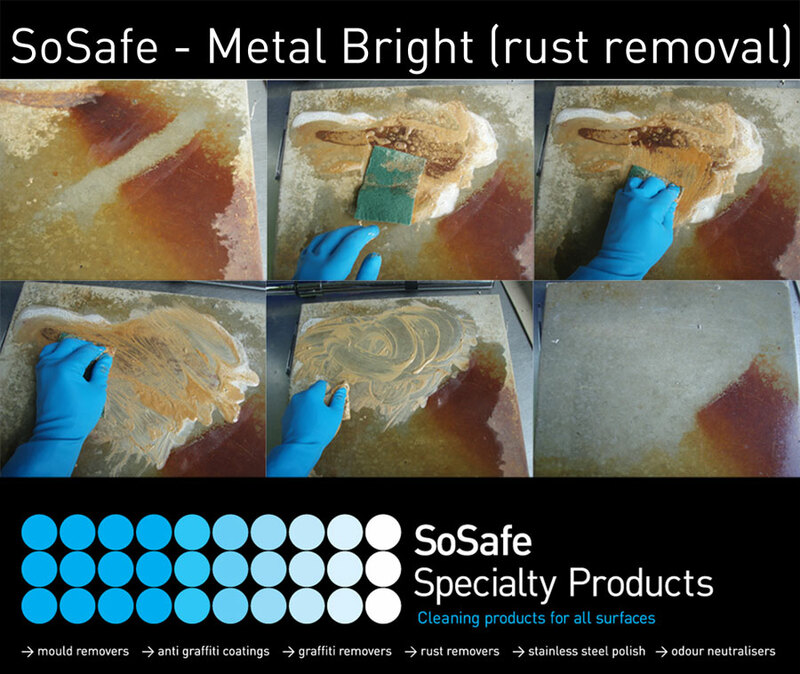 SoSafe Metal Bright has been specially formulated to remove surface rust, rust ‘tea-leaf’ stains and other rust stains from a multitude of hard surfaces. Metal Bright pacifies the surface, leaving a rejuvenated finish in as-new condition for pool chairs used by institutional facilities such as Public Works, Schools, Churches, Municipal pools, Hotels and Hospitality, Resorts, Water Parks, and Golf Courses. SoSafe Metal Bright addresses the rusting of metal fences around salt water pools, as well. It is also useful for in-home and nursing home facility bath tub lifts, and home swimming pools. A much safer, green alternate to hydrochloric acid, the application of SoSafe Metal bright to remove rust is fast, safe and easy. Step 1: Spray SoSafe Metal Bright onto rust effected surface. Step 2: Allow for 2 to 3 minute dwell time. A longer dwell time will reduce amount of "elbow grease". Step 3: Rub with non-scratch scrub pad. Step 4: Wipe clean with wet rag. Voila! Rust will be pacified and stainless steel will look revitalized. For added protected against future rust, apply SoSafe Stainless Steel Polish with Surface Active Technology and anit-microbial qualities. And other surfaces, including metals affected by ocean spray or snow removal salts.